The purpose of this page is to provide a source of information on all aspects of Mesopotamian mathematics. We explain the origins of mathematics in Mesopotamia from the earliest tokens, through the development of Sumerian mathematics to the grand flowering in the Old Babylonian period, and on into the later periods of Mesopotamian history. We include some general surveys to get you oriented in each period, and some more detailed resources for those interested in specific aspects of this fascinating episode in history. Like most other Web pages it is under slow construction as time permits. Some of these resources are of general interest, others are intended mainly for use by students in my History of Mathematics class. A very brief and biased summary of Mesopotamian (political) history. Intended to provide a context for the mathematical history in later pages. A summary chronology of the main periods of Mesopotamian history and the mathematics associated with them. A short summary of the main phases of growth in Mesopotamian mathematics. The topics mentioned here will all be expanded upon in later pages. A description of the early system of clay tokens, which was used from about 8000 B.C. and developed into Sumerian number systems. Summary of the development of Sumerian metrologically-based number systems and their evolution into cuneiform sexagesimal place-value system during the third millennium. Brief survey of the development of mathematics from 3000 -2000 B.C. A brief summary of Old Babylonian mathematics. This is the period for which we have the most evidence. Old Babylonian mathematics showed high development of problem solving, typically characterized as algebraic. The basic Old Babylonian cuneiform numbers, and words for numbers in Sumerian and Akkadian. 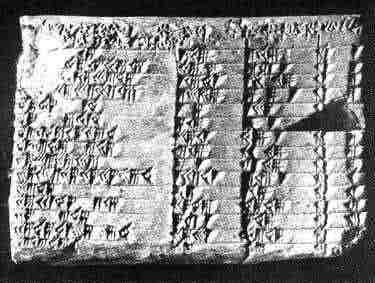 A summary of Old Babylonian single and combined multiplication tables with a list of principal numbers. A brief description of the procedure for finding reciprocals of regular numbers not in the standard table. Mesopotamian procedures for solving rectangular problems involving square roots. Tables of unit conversions for the standard sets of weights and measures used in Old Babylonian mathematics. There are many exceptions not covered here, especially for earlier and later periods. We have a page with some bibliographic sources including the excellent selective annotated bibliography by Eleanor Robson at Oxford and a draft of a more comprehensive bibliography. Links to tables of contents of journals publishing articles of interest to the mathematical assyriologist. Real tablets: Links to images, copies, transliterations and translations of Mesopotamian mathematical tablets. and the 'weighing stones' Old Babylonian problem text YBC 4652. The Uruk project has a site with details of several tablets, including some spectacular images and transliterations. The Vorderasiatisches Museum in Berlin has some excellent photographs of pre-OB VAT tablets as part of the Cuneiform Digital Library Initiative. Plimpton 322 at David Joyce's site (image)(transcription and commentary). The MacTutor Archive has an image of an Old Babylonian problem text from the British Museum BM 85194 (obverse only) and another image of Plimpton 322. Gary Stoudt has images of YBC 7289, the square root of 2 tablet in the Yale Babylonian Collection, and an image of the ubiquitous Plimpton 322. Christian Siebeneicher has a nice image of VAT 7858, an Old Babylonian 10-times table. Mock Tablets: Links to pretend tablets used by my students for practicing Babylonian mathematics. Reciprocals: A mock standard reciprocal table of the type used by Old Babylonians. Single Multiplication Tables with principal numbers p= 50, 48, 45, 44,26,40, 40, 36, 30, 25, 24, 22,30, 20, 18, 16,40, 16, 15, 12,30, 12, 10, 9, 8,20, 8, 7,30, 7, 6,40, 6, 5, 4,30, 4, 3,45, 3,20, 3, 2,30, 2,24, 2,15, 2, 1,40, 1,30, 1,20, 1,15. A metric geometry approach to the Theorem of Pythagoras. A map of Mesopotamia is available from the reports of the Oriental Institute Nippur expeditions. A brief introduction to Mesopotamian mathematics can be found at the MacTutor's History of Mathematics Archive page on Babylonian Mathematics. David Joyce's History of Mathematics site has a Babylonian page which includes a map, a brief bibliography, and a page on the Plimpton 322 "Pythagorean" tablet. Jöran Friberg has a web site listing his publications and giving links to his books. Hope Anthony's Guide to Ancient Near Eastern Astronomy seems to be gone from the Web now. Let me know if it comes back. The canonical source for all things Near Eastern is ABZU. Two organizations devoted to furthering the history of mathematics are the Canadian Society for the History and Philosophy of Mathematics (CSHPM) and the British Society for the History of Mathematics (BSHM). Their websites contain lots of useful resources for history of mathematics. An interesting site with numerous pages and links to ancient and classical history is the Ancient History part of the Mining Company. visits since 16 February 2003.